Trick or Treat & Eat Some Sweets! Oct 2018 TR Updated 3/20x2! 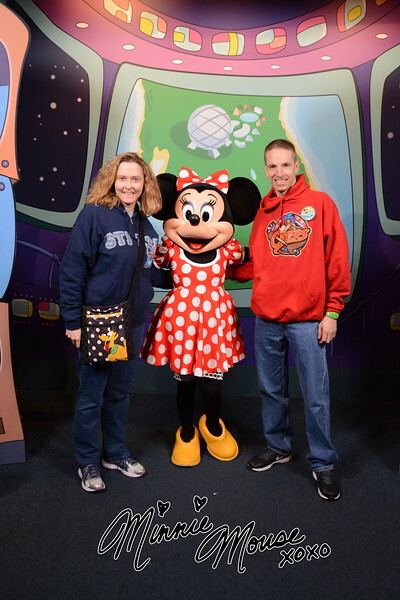 Discussion in 'Disney Trip Reports' started by Pluto0809, Nov 6, 2018. I always seem to start my TRs with “Howdy Folks” since I’m a bit obsessed with The Country Bear Jamboree, so “Howdy Folks” and welcome to yet another one of my TRs. If I’m counting correctly, this is my 16th TR here on the DIS. Every one of those is listed in my signature except my very first one. I screwed up the photos on that one and never went back to fix them. So if you are new to my TRs and are really ambitious or more likely just super bored right now, they are all there for the reading. I do think most people know me by now but here’s a bit of information just in case there are newbies out there. My name is Ariana, I’m 45 and live outside of Atlanta GA. 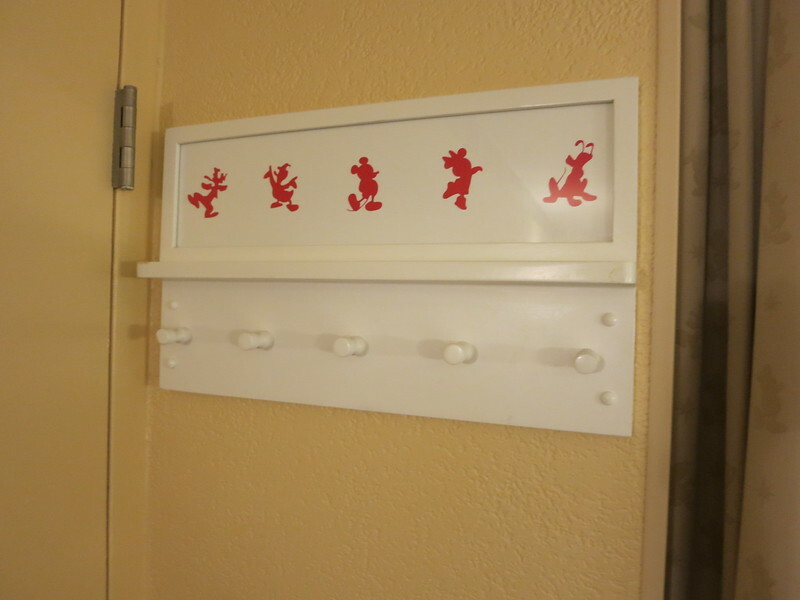 It goes without saying that I am a bit Disney obsessed but then again I think most of us on these boards are. I mean, who in their right mind spends hours reading about other people’s Disney trips? All kidding aside, I’m grateful for all my readers and also all the friends I’ve made here on the DIS. My husband Jim and I just hit our 20th anniversary (where the heck did those 20 years go?). He likes Disney but thinks my desire to go multiple times a year is a bit on the crazy side. I think he would be happy with every other year. I did get him to go twice this year much to his chagrin. Here we are during our January trip this year. We don’t have kids of the two-legged variety but we do have four furry butts that we consider our kids. First is Sierra. 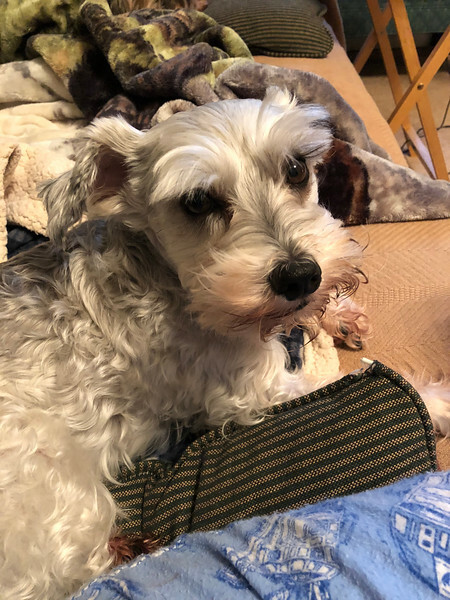 She is an 8 year old Miniature Schnauzer and the apple of her Daddy’s eye. She can do no wrong in his book. We brought her home as a puppy. 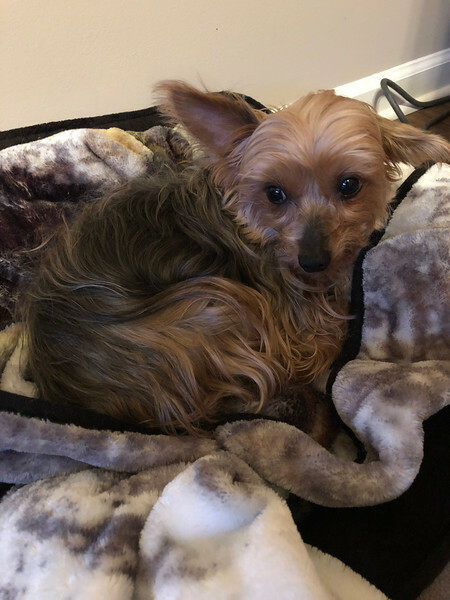 Next up is our little Yorkie, Remy, aka "The Little Rat", he’s also 8 years old. He came to us at the age of 4 from the local animal shelter where I volunteer. He was supposed to be a foster for a few days over Christmas but yeah, that didn’t work out. He immediately wormed his way into our hearts and ended up staying permanently. 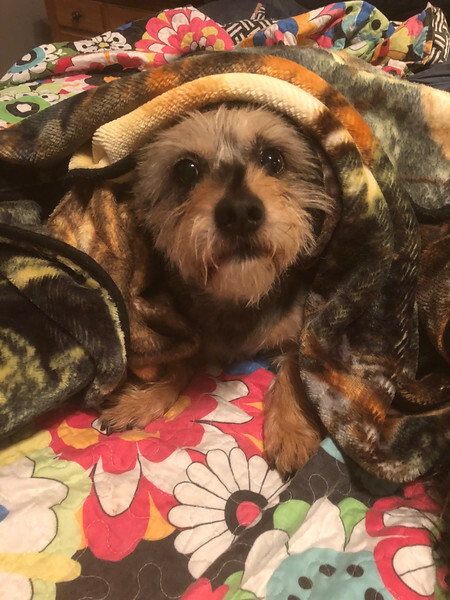 Next is Buddy, he’s 3 years old and we aren’t too sure what he is. He’s definitely got either Corgi or Dachshund in him because he has a long body and short stubby legs. But his fur is that of a Schnauzer or Yorkie, soft and non-shedding. So he could be a Schnoxie or a Schnorgi or a Yorgi or a Dorkie or… Well you get the idea, he’s basically a Heinz 57. We brought him home from the shelter to be my dog when my sweet boy Alex passed away last year. But alas, Buddy immediately took to Jim and is pretty much 100% his dog. Or youngest baby is Elle, she’s just over 2 years old and she’s an absolute nut. 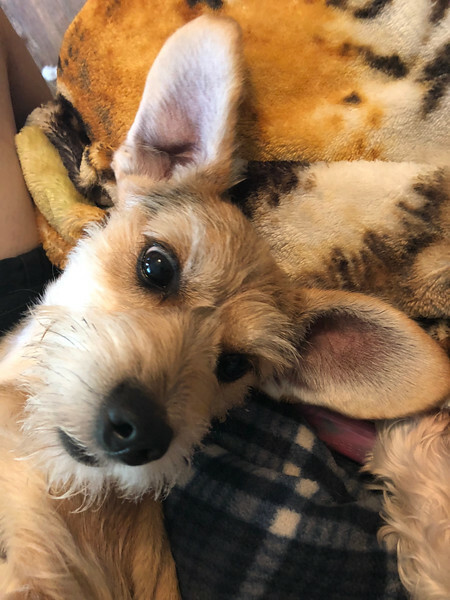 Once again she’s a mix but I think she may be Schnauzer/Jack Russell because she displays strong traits from each breed. She never stops moving and is always outside chasing the squirrels. She will hop in a lap for a few minutes but then she’s off again. All right, that’s enough about me, I’m sure you will learn more as we go. So let’s move on to the actual trip. Starring in this TR will be, left to right, me, Jim, my Mom, my sister in law Jocelyn and my brother John. My Dad passed away back in 2007 and John and Jocelyn don’t have kids either so this is basically my entire immediate family. 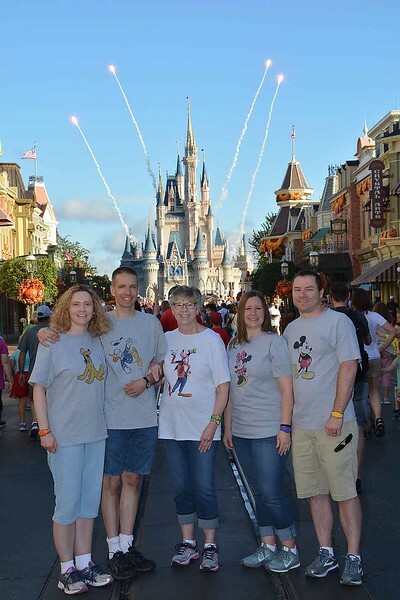 This trip was actually the first time that all five of us have gone to Disney together. Well, Jim was there in 2014 for my Cousin’s wedding but he didn’t go to any parks with us. John and Jocelyn like Disney but also love traveling to other places so they only go to Disney about every four years. So this was their first trip since 2014 and there was a lot of new stuff that they had not seen. 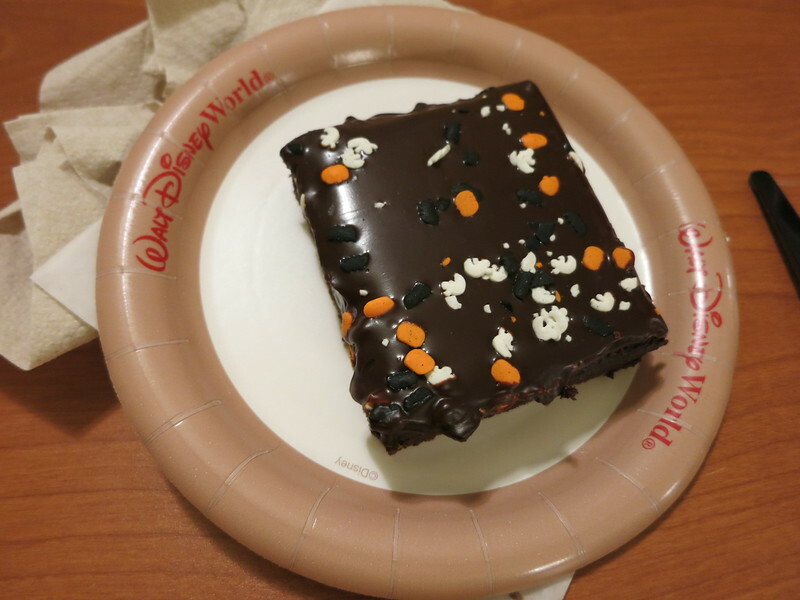 The main focus for this trip was the Food and Wine Festival but we also got to go to the Halloween Party for free (I’ll explain how that happened once I get to our party day). Hence the title for this TR, Halloween and eating a lot of food. We stayed at All Star Music with one night thrown in at All Star Sports for Jim and me. Jim - October 18th – 24th. I’ll explain how all that craziness worked once I get into the meat of the TR. And speaking of that, I think this intro has gone on long enough so let’s move on to the good stuff! chunkymonkey, BlvInMagic, DLo and 9 others like this. buzzrelly, disneyAndi14 and rteetz like this. When we first planned this trip, Jim and I booked flights on Saturday, October 20th and timed our arrival at MCO to be within an hour of Mom, John and Jocelyn. 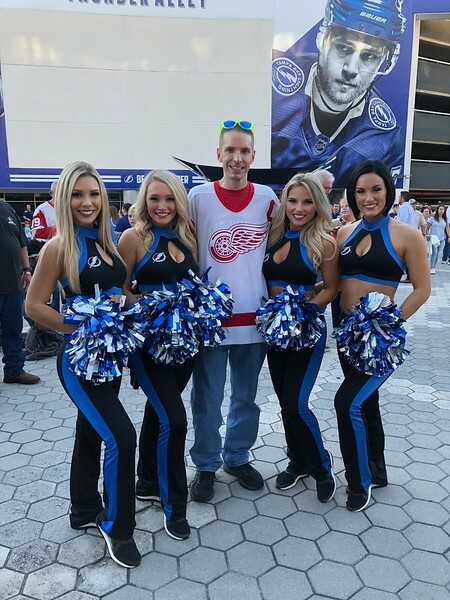 But a few months before the trip, Jim asked me if I wouldn’t mind if he flew down a few days early so he could go see his Detroit Red Wings play in Tampa on 10/18. Because we no longer have a professional hockey team in Atlanta, he never gets to see them play live any more. I was fine with that so we changed his flight (thank you Southwest for having no fees for changing flights!) so that he would be flying into Tampa on 10/18. 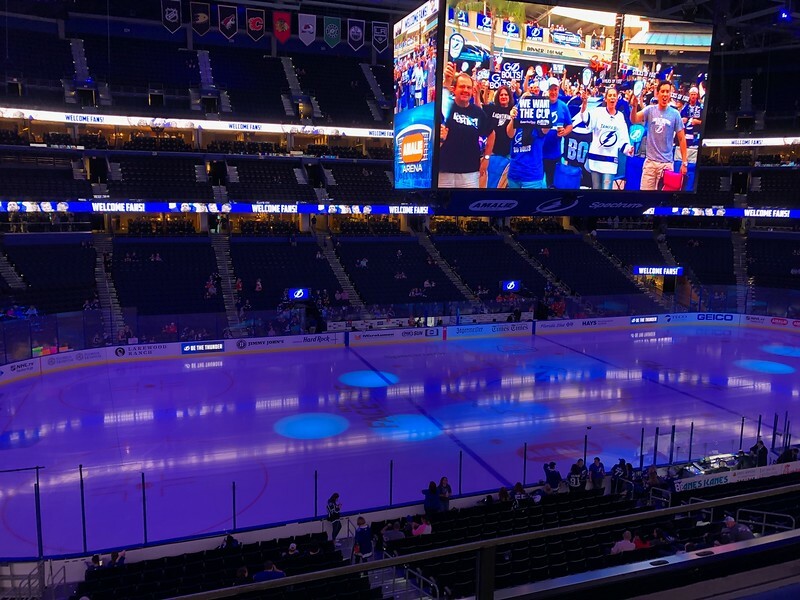 His plan was to get a rental car in Tampa and stay one night near the arena. He was then going to drive up to Orlando, check in at All Star Sports for one night and return his rental car near Disney Springs. This left me in a bit of a dilemma because it meant I would be driving to the airport by myself in the middle of the night. I was not happy doing this so I decided to change my flight to Friday and join him at All Star Sports for the one night. 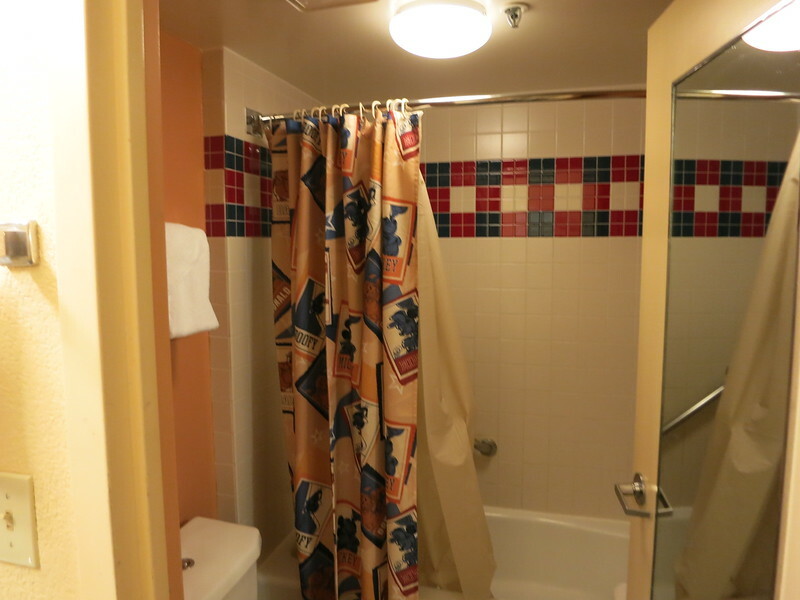 I did try to book us one night at All Star Music so we didn’t have to move resorts, but there were no rooms available there for that one night. So Jim flew out to Tampa on the 18th. It was his first time flying Southwest and he ended up liking it a lot. He has been leery in the past because he gets claustrophobic on flights and has to have an aisle seat. He did not like the idea of no assigned seats on Southwest. But adding early bird, which got him on the plane in the first group solved that problem. He made it just fine to Tampa, got his car and checked in at the hotel. He decided to Uber to the game so he didn’t have to worry about parking. He made some friends before the game started. Managed to get an excellent seat in club level without realizing that was the ticket he bought. 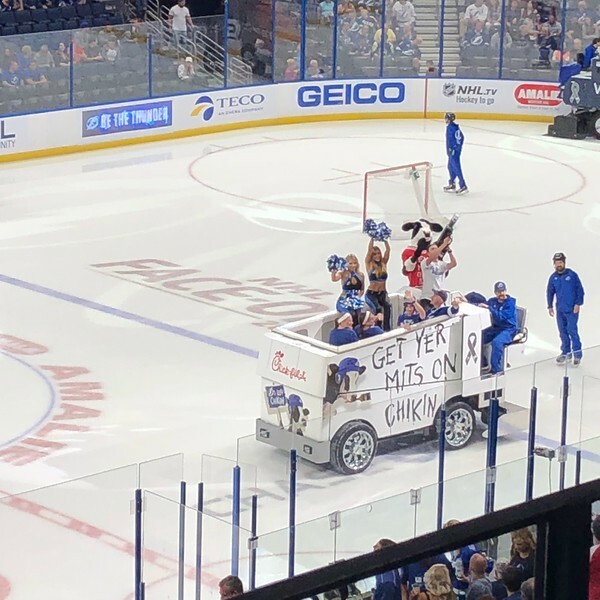 And also enjoyed the Zamboni a little more than usual. His Red Wings lost 3 to 1 but that wasn’t surprising as they are pretty bad this year. He Ubered back to his hotel and then the next morning headed towards Orlando. 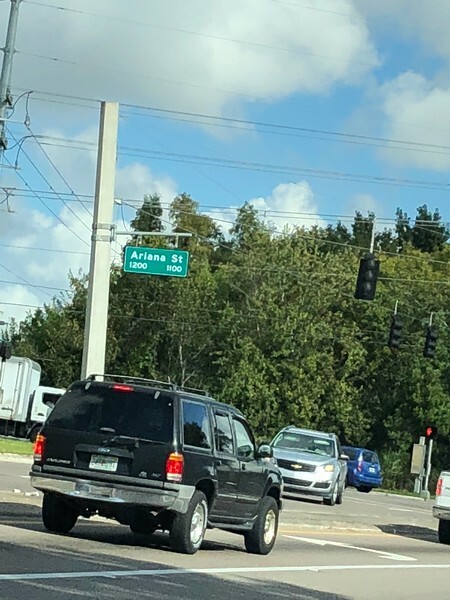 He sent me this picture of an interesting street name he spotted in Tampa. 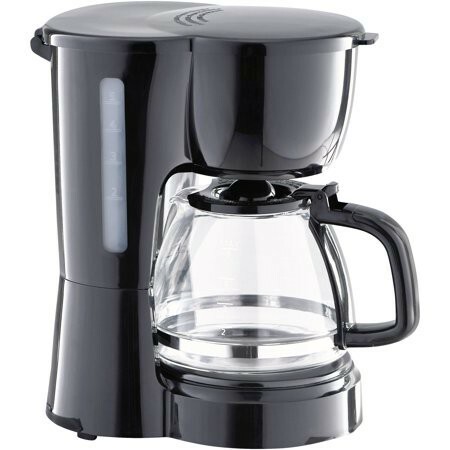 On his way to All Star Sports, my Mom asked him to stop off at Walmart and pick up two coffee pots for our rooms. They were $9 a piece so much cheaper than buying coffee every day. Mom and Jocelyn are big coffee drinkers so they just brought supplies from home to make their own coffee. I pre-ordered the pots for him so he just had to run in quickly and pick them up. Meanwhile, back in Atlanta, I got up on Friday and took the dogs to our local vet where we board them. I got there around 8:00 am because I knew it would take about a ½ hour to get all the paperwork done. I typed everything up ahead of time but the front desk girl insisted on transferring it all onto their forms which took a bit. I had no trouble bringing them in this time because two of the boarding staff came out to my car and helped me get them into the building. Juggling four dogs by myself is quite the feat. After that, I headed back home to load up my suitcases and make one final check of the house before heading to the airport around 9:30 am. I ended up taking the new express lanes that opened recently in Atlanta and bypassed the tail end of rush hour traffic. This got me to the airport very early so I decided to sit down at Long Horn Steakhouse for lunch. It happened to be directly across from my gate so very convenient. I started off the trip right with steak and French fries. 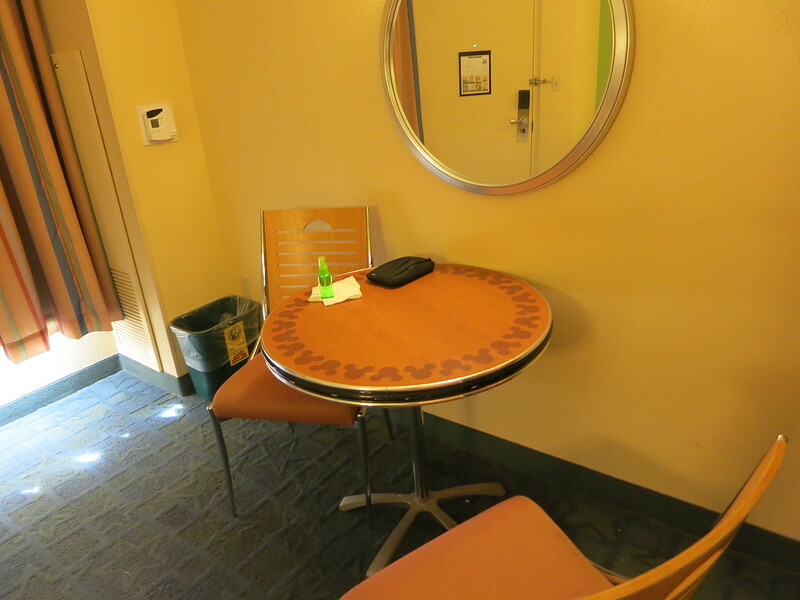 While I was waiting to board my plane, Jim called and said he had checked into the hotel and they had given him a room in the Tennis section. I was a bit annoyed with him because I had told him not to check in since I had already done it online. I had requested the Baseball section since it was closest to All Star Music and less of a walk the next day with all our luggage. I don’t know for sure but I think when he went to the desk, the CM most likely just put him in the first available room which overrode my request. Not a huge deal but it would have saved us some walking. Any ways, we were in Building 5, Floor 3, Room 5359. 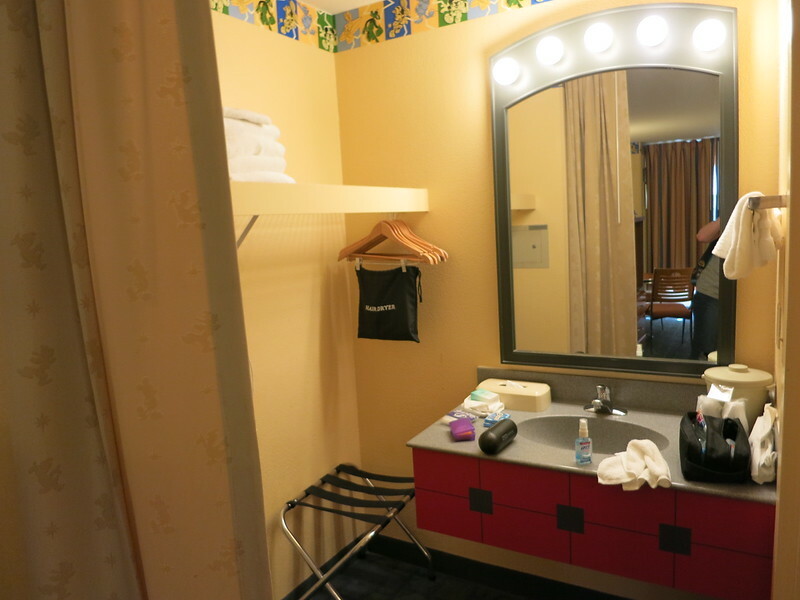 He dropped off his stuff in the room and then headed to Disney Springs to return his rental car and do some shopping. 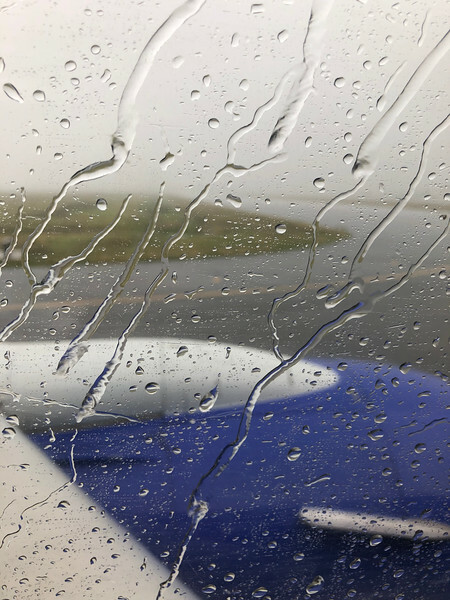 My flight was uneventful but this was the sight out the window when we landed around 3 pm, torrential downpour. The landing was a tiny bit rough to say the least. Yuck! Not what I wanted to see for the start of our trip. Being by myself I was able to make it quickly to the Magical Express where there was no line. The CM did ask me why Jim wasn’t with me but after explaining that he had flown down the day before, he directed me to a line. Oh, I did have one annoying thing happen at the fake-o-rail. A family got on and apparently another of their party was running behind. So one of them stood in the doorway so that the door couldn’t close and held up the train for a few minutes until that person got there. Annoying because the trains come like every few minutes so they could have just waited for the next one instead of holding up the rest of us. 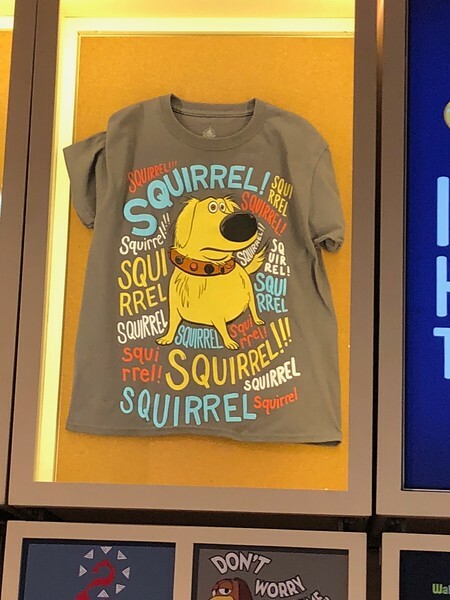 While I was on the DME, Jim was texting me pictures from Disney Springs of things he thought I might want to buy. He ended up buying me the Pluto shirt and the Pluto stuffie because he knows how obsessed I am with Pluto. 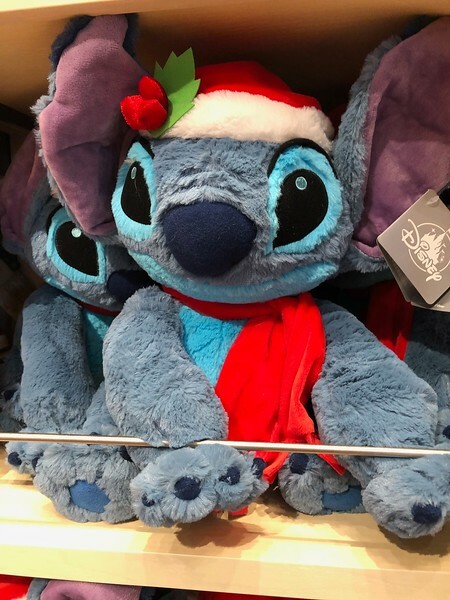 I probably would have had him grab Stitch too but I already had him. 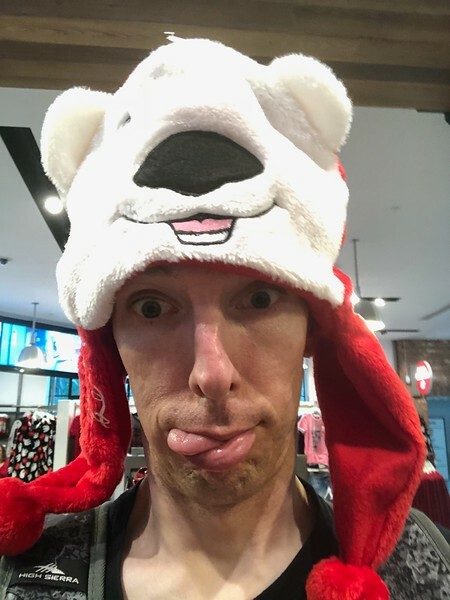 He also visited the Star Wars store, the Lego store and the Coke store during which he sent me this lovely selfie. I made it to the resort and the rain had pretty much stopped. It didn’t take me too long to find our room. First, here’s the view from the door. And some pictures from the room. 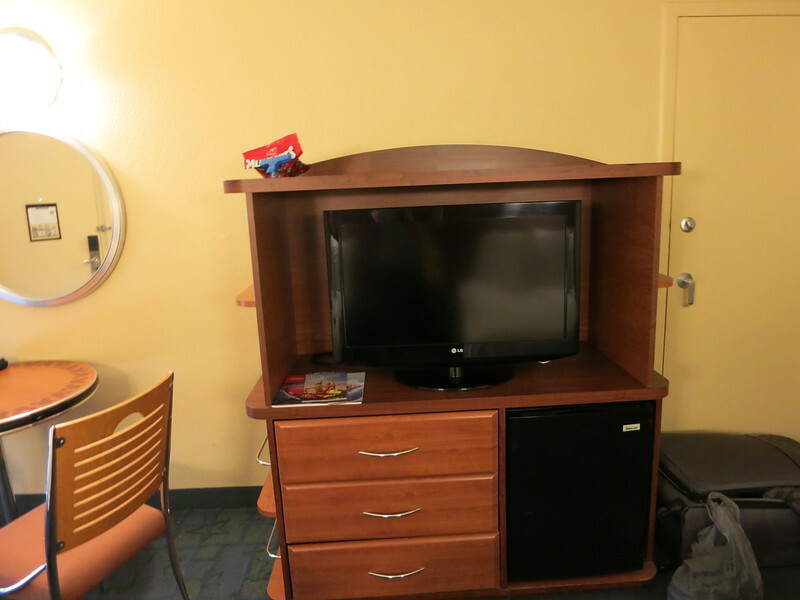 As you can see, Jim had already spread out his stuff all over the room. I freshened up a bit and then headed back out to the bus stop to join Jim in Disney Springs. 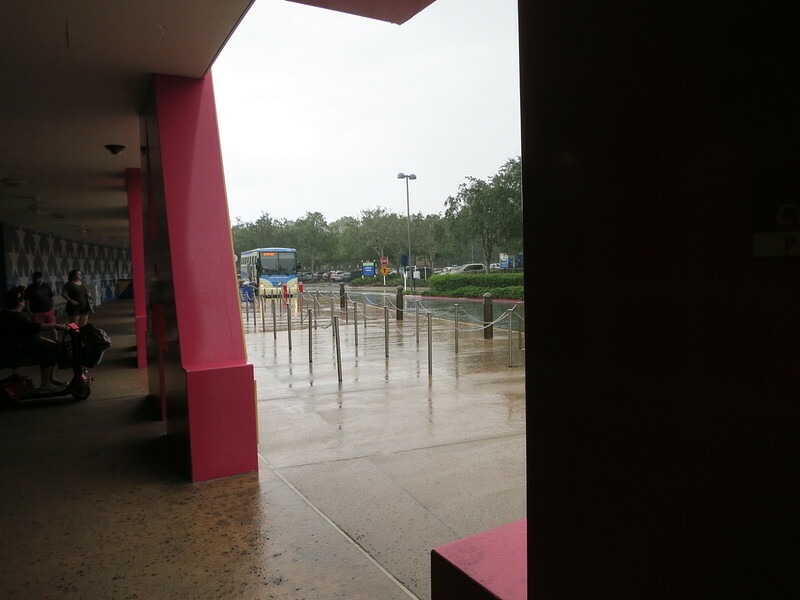 It started to rain again but I just waited back under the awning as there was no line for DS. By the time I got to DS, the rain had finally stopped for good. 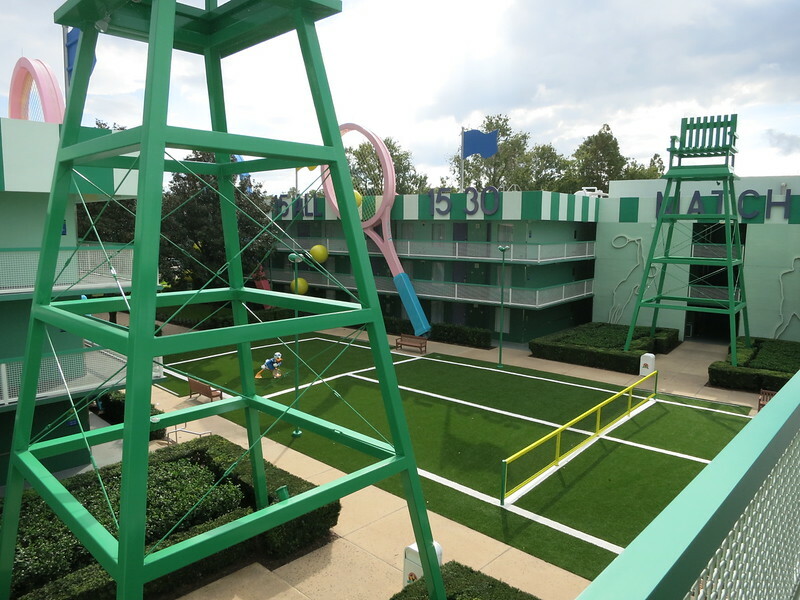 I met Jim near the Coke store and we walked over to World of Disney so I could look around. The only picture I have before dinner is of Jim modeling the Slinky Dog ears. This was the first time I had seen the renovated WOD and I actually liked it. Yes, it’s a bit more on the sterile side now but I loved the wide openness of the different areas. It seemed to be much easier to get around than before. 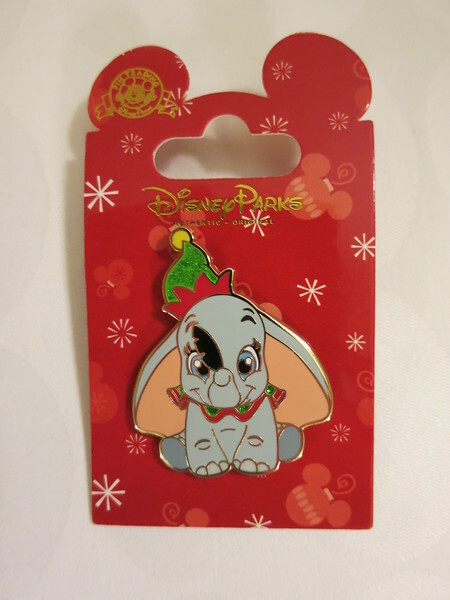 I did find two items to buy, first was a Dumbo Christmas pin. 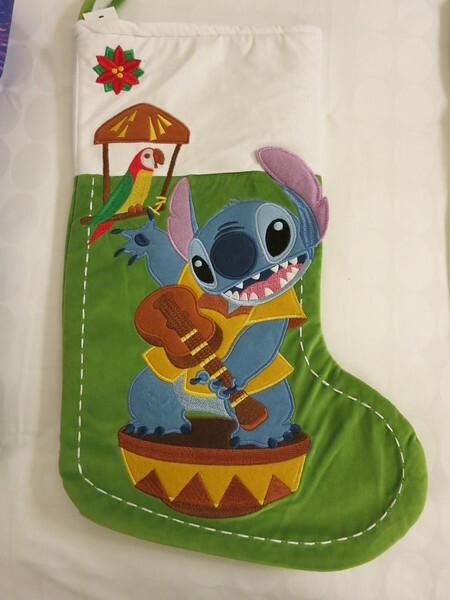 And second was a Stitch stocking. We also walked through Arribas Brothers and the Co-Op Marketplace. I found a shirt at 28 and Main that I picked up for my brother. We checked out the new Dog Tails store but didn’t buy anything at that time. It was around this time that Jim decided he had to have a lottery ticket for the big drawing that night. I think it was around 900 million at that point. Why he hadn’t stopped and got one earlier in the day when he had the car, I have no idea. He decided to walk across the pedestrian bridge to the gas station near DS so we split up with a plan to meet at House of Blues for our ADR at 6:30 pm. I continued shopping my way towards HOB. He ended up having a bit of an adventure and was almost late for our ADR. Apparently that gas station was on Disney property and they don’t sell lottery tickets on Disney property. So he had to Uber to a gas station about a mile away and then Uber back to DS after getting his ticket. But he finally made it back a few minutes late and we were still able to be seated immediately. I started my meal with a Memphis Blues Sangria (fresh fruit, red wine, brandy, orange liqueur, pomegranate and orange juices) and Jim got a Rum and Coke. This was not my favorite Sangria. 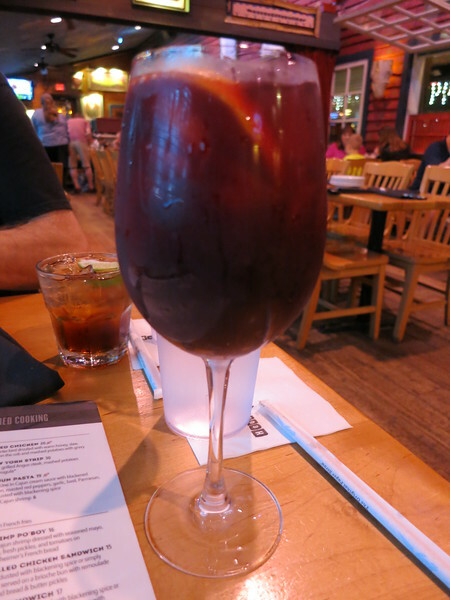 It was very tart and I just prefer sweeter Sangrias. I don't think I would get it again. 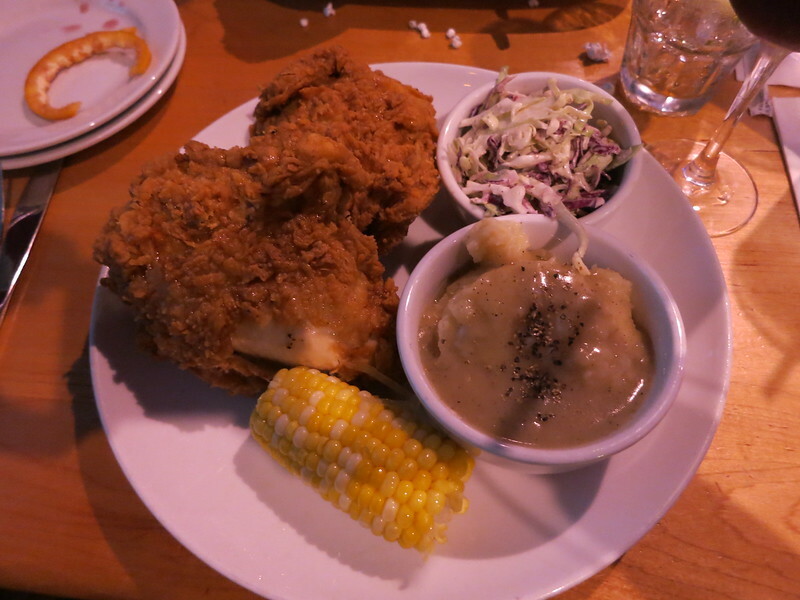 For our entrees, I got the Fried Chicken (a quarter bird drizzled with warm honey, slaw, corn on the cob and mashed potatoes with gravy). 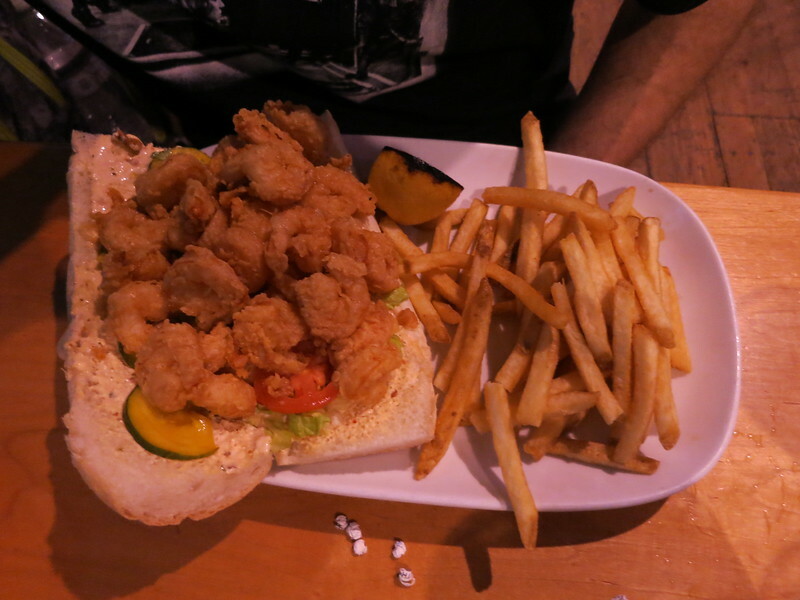 And Jim got the Shrimp Po’Boy (fried Cajun shrimp dressed with seasoned mayo, lettuce, fresh pickles, and tomatoes on Leidenheimer’s French bread). Both of our dishes were excellent. Surprisingly while everything on my plate was yummy, the best thing was the mashed potatoes and gravy, they were so good! I kind of wanted dessert but there was nothing on the menu that tickled my fancy so we headed out. We did make a brief stop at the Coke store so Jim could pick up some tin signs he saw earlier. I thought I took pictures of them but can’t find them right now. We caught the bus back to All Star Sports and made a quick stop at the food court so I could grab something sweet. I ended up with a chocolate brownie and it was huge and very rich! I only managed to eat half of it but Jim was happy to finish it for breakfast the next morning. Normally I post my pin trades and also my Fitbit stats at the end of each day. But pin trading was absolutely awful this trip, I saw very few pins worth trading for. And on this day I didn’t find any at all. 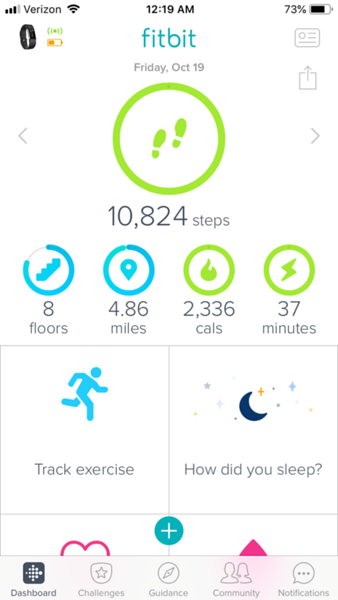 I do have my Fitbit stats though, not a huge walking day for me. chunkymonkey, Jenny Sanders, *tinker*bell* and 9 others like this. Hi Ariana looking forward to reading all about your trip. I love being on page 1 Now, back to read!! Well even though I’m fairly absent from the Dis these days, I did read your intro and first post so hopefully I can keep up but if not, at least I got those two posts in. Ugh. I’m a horrible Diser these days. Anyway, I forgot you guys are in Atlanta, too! My DH works for 680 The Fan and gets free sports events tickets so we should get together at some point! He should've asked them to sign his autograph book!! Sounds like Jim had a nice time on his solo venture to Tampa! Glad to hear you had no problems meeting him down there. 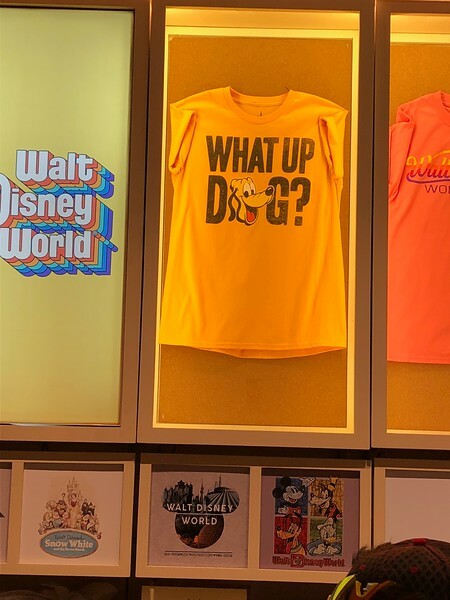 Sounds like a nice first night at Disney Springs! I’m joining in, DS for the first night is always a good place to start a trip especially when you had an extra night! We have tried HOB and really liked our food there as well, it has been awhile since we have been there. 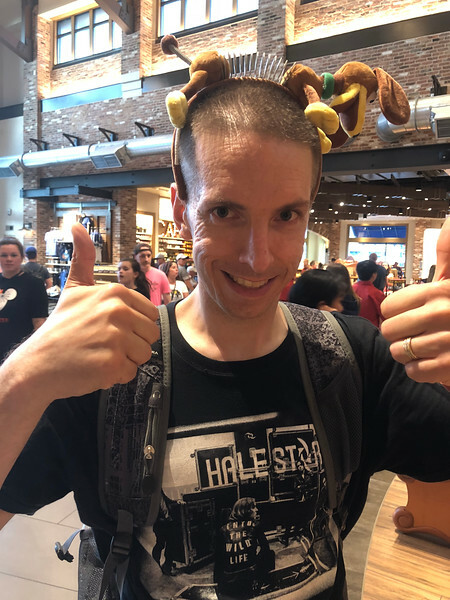 My husband is the same way, he had to get a lottery ticket that night and he was on a trip, he made sure to find a store selling the tickets, didn’t win of course, otherwise I would be in Disney World right now, lol! 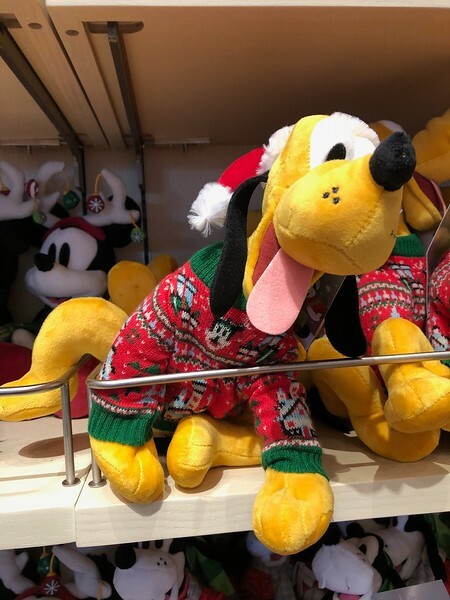 I love the Pluto shirt and the Christmas Pluto. Andi loves Pluto, she has the Pluto hat and it is signed by the Fab 5. Here and back to read later. Yay! another TR! following along and looking forward to all your adventures. 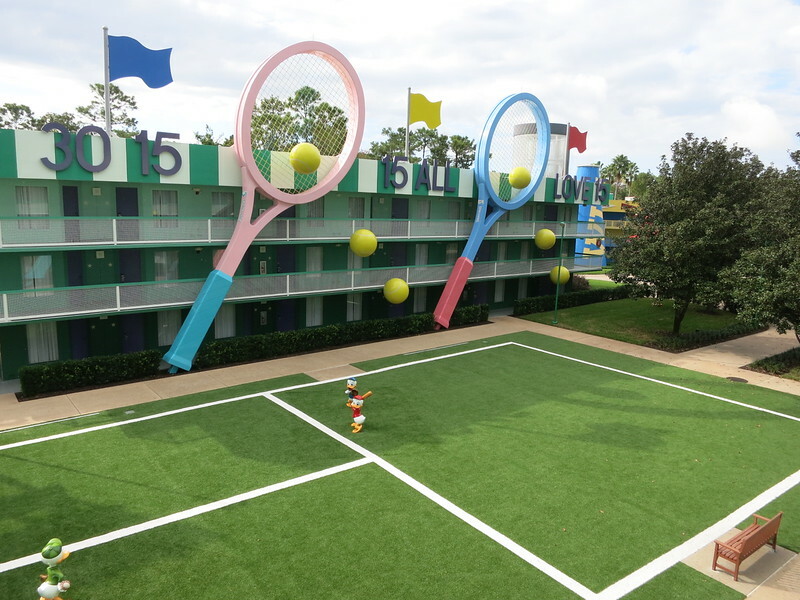 We left WDW on the 20th after two VERY hot and humid weeks...didn't expect it to be in the 90's that much. Doesn't this resort have coffee pots in the room? interesting. 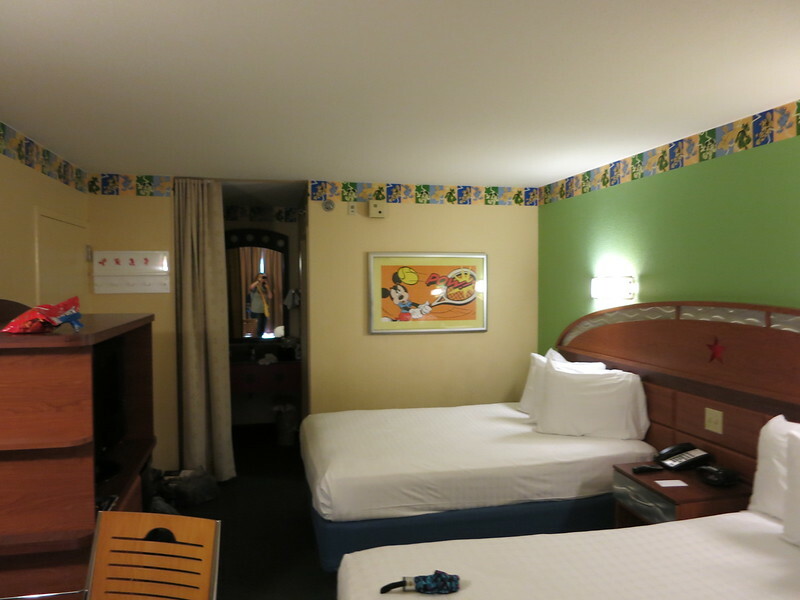 I found an amazing airfare for early December and we ALMOST went for another dose of Disney, but came to my senses (or not lol) and decided to stick to our plan of driving to California instead. Did it rain a lot while you were there? Can't wait to hear more. Your first night sounds great! Following! Fun that Jim got to have some alone time first! This has happened to us a couple times now; once when the 4 of us were originally flying down together but then made a change, so Chris and I came down 3 day before Ricky and Steve. Then this past May we flew down with my stepson but his gf picked him up at MCO. He was on our reservation so they asked why their were only 2 of us lol. Never seems to be a problem but they do check. Joining in for another one! Too bad you didn't get the Baseball section. The room I had at ASMu was right on the end of Calypso building 1, by the parking lot, so our view the whole trip was the Baseball section at Sports. I wasn't sure how I felt about the new look World of Disney. It was only half done in August when I saw it. But most people are saying they like it, especially now it's been fully revealed. 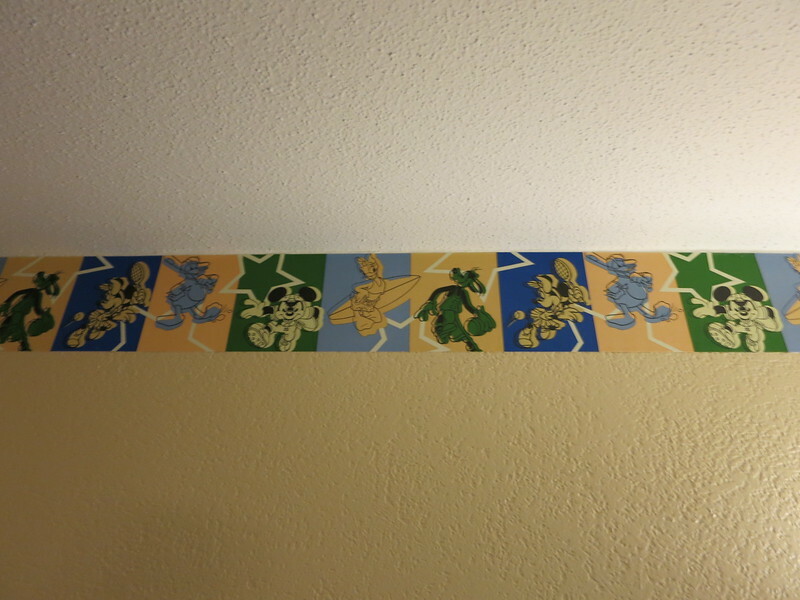 I still miss the Disney figures on the ceiling. I think I would need to see the finished product to decide. I am here! Just got back from WDW myself. 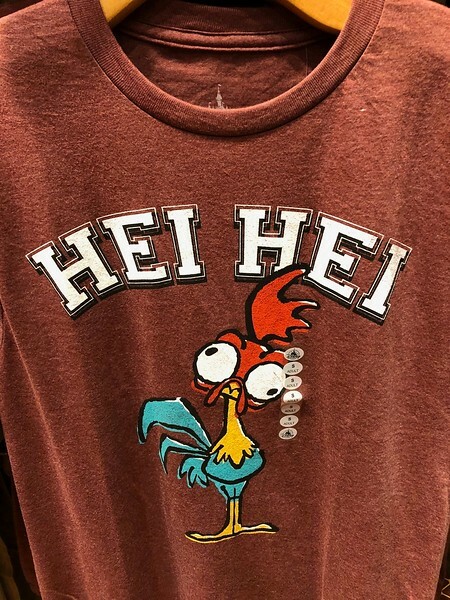 I always seem to start my TRs with “Howdy Folks” since I’m a bit obsessed with The Country Bear Jamboree, so “Howdy Folks” and welcome to yet another one of my TRs. If I’m counting correctly, this is my 16th TR here on the DIS. Funny how those creep up on you. I just mentioned the other day and had to count first. I was actually surprised at how many I was up to. Every one of those is listed in my signature except my very first one. I screwed up the photos on that one and never went back to fix them. I need to go back and fix all the links in my first one. Not exactly worrying about it much. Nah. We've met. Probably closer to 35. 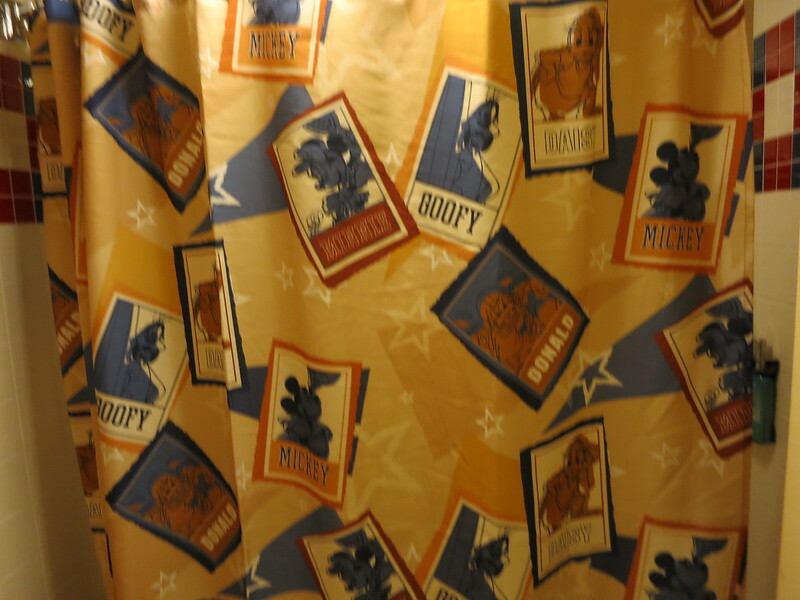 It goes without saying that I am a bit Disney obsessed but then again I think most of us on these boards are. I mean, who in their right mind spends hours reading about other people’s Disney trips? My husband Jim and I just hit our 20th anniversary (where the heck did those 20 years go?). Sorry to hear that Ariana. This trip was actually the first time that all five of us have gone to Disney together. Huh! But at least most of the dates overlap. Sorry (not sorry) about that! He did not like the idea of no assigned seats on Southwest. But adding early bird, which got him on the plane in the first group solved that problem. I've heard of that early bird on someone else's TR. I'd be getting that every time. I've never flown where the seats weren't assigned and I pretty much always check in 24 hours in advance so I can get what I want. He made some friends before the game started. I like Jim's friends too. Although I am surprised they became friends considering the shirt he was wearing. Nice of him to do that for you. my Mom asked him to stop off at Walmart and pick up two coffee pots for our rooms. They were $9 a piece so much cheaper than buying coffee every day. Huh! Never heard of anyone doing that before! I typed everything up ahead of time but the front desk girl insisted on transferring it all onto their forms which took a bit. Juggling four dogs by myself is quite the feat. I forgot to mention in the previous comments how cute your pups are! I ended up taking the new express lanes that opened recently in Atlanta and bypassed the tail end of rush hour traffic. I don't recall seeing that. How does that work? Do you need a pass? 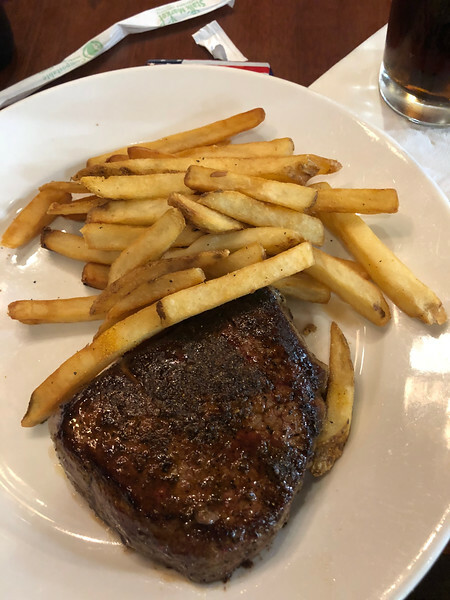 I started off the trip right with steak and French fries. I like the way you start a trip! 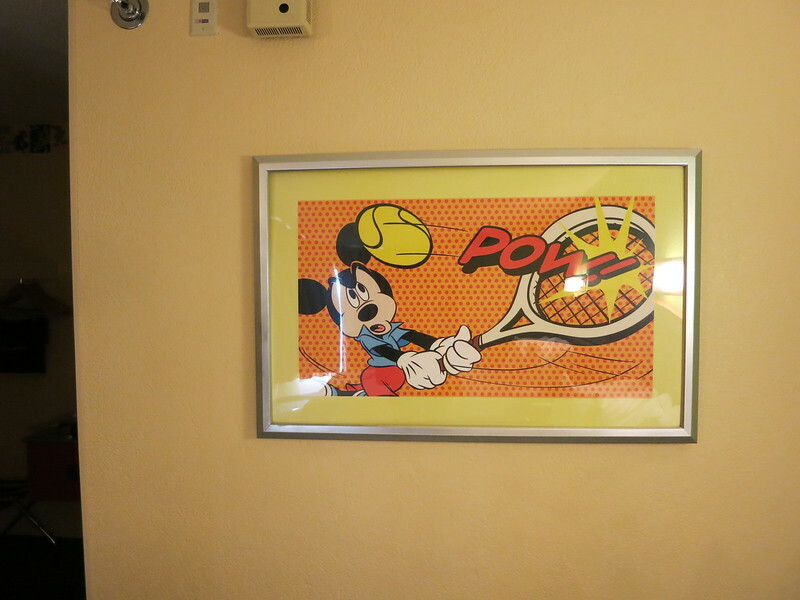 While I was waiting to board my plane, Jim called and said he had checked into the hotel and they had given him a room in the Tennis section. I was a bit annoyed with him because I had told him not to check in since I had already done it online. I had requested the Baseball section since it was closest to All Star Music and less of a walk the next day with all our luggage. I don’t know for sure but I think when he went to the desk, the CM most likely just put him in the first available room which overrode my request. Not a huge deal but it would have saved us some walking. Ever since our first stay at ASMu, I try very hard to get a closer room/building. Those far buildings are far. Oh! Is that where the car care center is? I'm renting (I think) there next year. "Here! Here! Take a bunch of unlimited fast passes! Geesh! Here!!" Oh, I did have one annoying thing happen at the fake-o-rail. A family got on and apparently another of their party was running behind. So one of them stood in the doorway so that the door couldn’t close and held up the train for a few minutes until that person got there. First, here’s the view from the door. I just waited back under the awning as there was no line for DS. Did that too. But for shade. The only picture I have before dinner is of Jim modeling the Slinky Dog ears. I just saw those on another TR. I like them. This was the first time I had seen the renovated WOD and I actually liked it. Yes, it’s a bit more on the sterile side now but I loved the wide openness of the different areas. Huh. Haven't been in a long while. 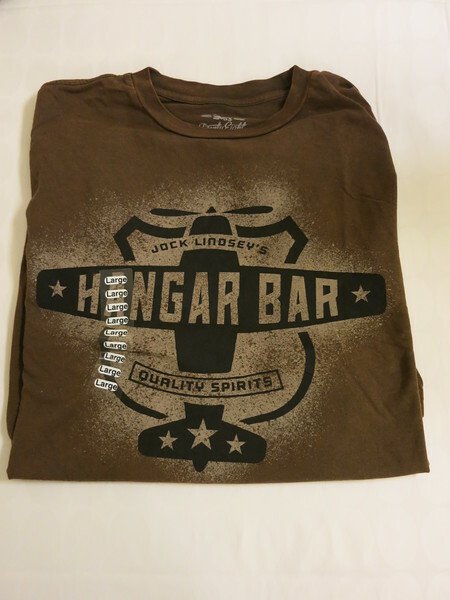 I found a shirt at 28 and Main that I picked up for my brother. I like that! Gonna have to look for that one. Jim decided he had to have a lottery ticket for the big drawing that night. I think it was around 900 million at that point. Why he hadn’t stopped and got one earlier in the day when he had the car, I have no idea. Apparently that gas station was on Disney property and they don’t sell lottery tickets on Disney property. Really! I had no idea. Huh. Guess Disney wants all your money. None to go to the lottery. So he had to Uber to a gas station about a mile away and then Uber back to DS after getting his ticket. Wow that sounds good too! I'd have a hard time deciding.